CONGRESSIONAL MAP BACK IN COURT: Maryland’s infamously contorted congressional district map was challenged in federal court on Tuesday by an American University law student who says the boundaries violate the First Amendment rights of Republican voters, Bill Turque of the Post reports. The suit was thrown out by a federal judge in 2014, a decision upheld by the U.S. Court of Appeals for the 4th Circuit. But the Supreme Court ruled in December that plaintiff Stephen Shapiro was improperly denied a hearing before a three-judge panel. MOVEMENT TOWARD RX POT: The 15 marijuana growers and the first wave of processors that together will launch Maryland’s medical marijuana industry could be chosen as soon as Aug. 5, writes Erin Cox in the Sun. The licensing decisions come after months of delay for the hundreds of applicants seeking to grow and process medical marijuana in Maryland. “We realize that everyone in this room, the industry and patients, are eager to get going,” said Paul W. Davies, chair of the Natalie M. LaPrade Maryland Medical Cannabis Commission, at a public meeting Tuesday. “We don’t want to waste a day.” Daniel Leaderman reports for the Daily Record that the commission received more than 800 applications from entities looking to become marijuana growers, processors or dispensers in the state. The commission can award up to 15 grower licenses and an unlimited number of processor licenses. State law allows for up to two dispensaries per senatorial district. Once approved, awardees have one year to complete all the necessary steps to obtain a formal license, writes Holden Wilen for the Baltimore Business Journal. The Marc Steiner Show on WEAA-FM hosts a discussion on on medical marijuana licensure in Maryland with attorney Jon Cardin, former state delegate and Demetrios Kafouros, CEO and founder of GreenLabs Inc. CARGO & THE ECONOMY: If shippers can’t get their cargo in or out of a seaport quickly, what happens? They route their cargo to a more efficient port and take jobs with them. If you grasp this concept, then you will grasp Baltimore’s Howard Street railroad tunnel problem. In the logistics and transportation world, cargo-in-motion makes money. Cargo at rest doesn’t, writes Richard Douglas in an opinion column for MarylandReporter.com. GENERAL SERVICES CHIEF NAMED: Gov. Larry Hogan has named the No. 2 official in the Department of Housing and Community Development to head the agency that operates state buildings and handles most of its real estate transactions, writes Michael Dresser in the Sun. Ellington Churchill Jr., 46, will succeed C. Gail Bassette as secretary of General Services, a job that pays $146,743 a year. Bassette resigned early this month after only 18 months on the job. KEEP SAVING THE BAY: The editorial board for the Carroll County Times urges the state to keep working on solutions for the Conowingo Dam in its efforts to save the Chesapeake Bay, writing that Gov. Larry Hogan’s announcement last week that he is seeking private sector ideas on how to prevent sediment and phosphorus pollution from spilling over the Conowingo Dam and polluting the Chesapeake Bay was a significant one. During a large storm, the millions of tons of sediment that have been building up behind the Conowingo Dam can easily wipe out years worth of efforts. MEDIA AIDS DEMS IN HOGAN BASHING: Columnist Greg Kline, in an opinion piece for MarylandReporter.com, writes that for months now, Maryland Democrats have been trying to find a way to attack Gov. Hogan in an effort to bring down his record high approval ratings. And they have willing accomplices in the media. PG ACTIVISTS OPPOSE ENLARGED COUNCIL: More than two dozen citizen activists voiced strong opposition Monday night to a measure that would add two new at-large seats on the Prince George’s County Council, arguing the costs outweigh the benefits to residents, Arelis Hernandez reports for the Washington Post. SZELIGA’S COFFERS: Del. Kathy Szeliga, the Republican nominee for Maryland’s open Senate seat, raised nearly $600,000 in the second quarter of this year — significantly more than previous GOP statewide candidates here, writes John Fritze in the Sun. Szeliga, a Baltimore County Republican, raised just more than $582,000 from April through the end of June, the campaign said. The figure is more than double the amount raised by Republican Dan Bongino during the same period of his campaign against Sen. Ben Cardin in 2012, and it is slightly more than Gov. Hogan raised from donors in 2014. DUTCH ALLIES WITH VETS: Maryland Rep. Dutch Ruppersberger says he’s ready to assist anyway he can to return a veterans health care facility to eastern Baltimore County as quickly as possible, according to an AP story at WTOP-AM. PEREZ & HILLARY CLINTON: Edward-Isaac Dovere of Politico writes about Labor Secretary Tom Perez, the Montgomery County resident who is now part of the inner circle of potential running mates for Hillary Clinton. Blogger Jeff Quinton, in his Quinton Report blog, writes Ehrlich being called out by federal prosecutors for writing the letter. 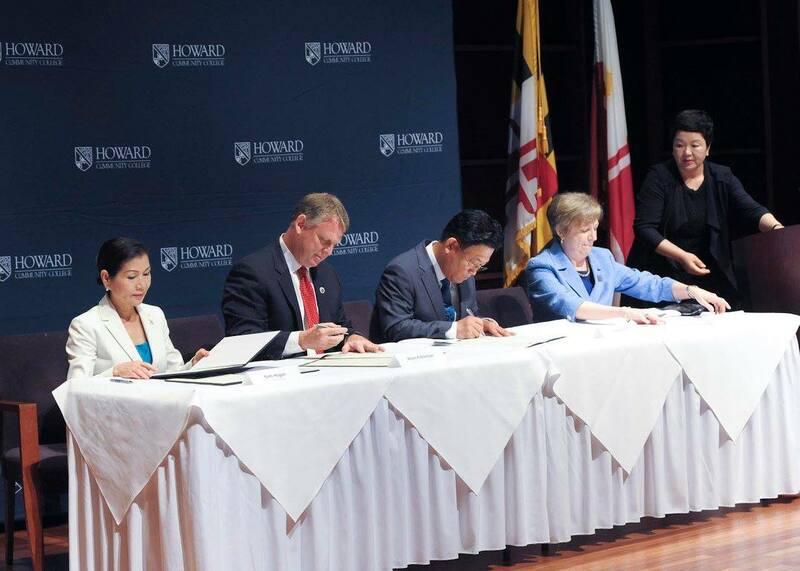 HOWARD COUNTY, KOREAN CITY EXCHANGE PROGRAM: Howard County Government, Howard Community College and Naju City of the Republic of Korea signed agreements for a cultural and educational exchange program Tuesday in a ceremony at the college. Maryland first lady Yumi Hogan, far left, a native of Naju, attended the ceremony with Howard County Executive Allan Kittleman, Naju City Mayor In Kyu Kang, and HCC President Kate Hetherington. Photo by Governor’s Office.